I went for a short bike ride through the port lands yesterday, the first time I’ve been down there since the autumn. Unlike most winters, there’s quite a bit of work going on. It’s also a little more challenging than usual to get into the area, as two of the three access roads are closed for bridge repairs. 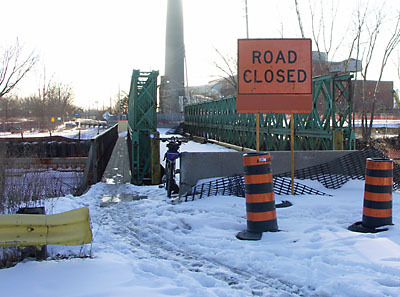 The single-lane Unwin Ave bridge just west of Leslie is closed to traffic, though pedestrians and cyclists on skinny bikes can still use the narrow pedestrian walkway. The walkway is also just one lane wide, so you better hope that you don’t need to pass someone in the middle. Fortunately, it’s not usually a problem at this time of year. Or any time of year, really. The decking on one section of the bridge roadway has been pulled up and piled to one side as if the reason for pulling up the deck was more to prevent passage than to make repairs. The channel that the bridge spans was recently blocked off from the lake by a cofferdam and is being drained so that it can be dredged and repaired. 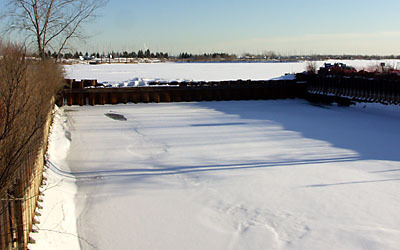 It used to be the discharge channel for the Hearn generating station, and will be reused as the discharge channel for the Portlands Engergy Centre. This maintenance should be complete by the end of May. Great White North dragon boats ususally launch from this channel for practices in the Outer Harbour. If all goes according to schedule, they won’t have to portage around the dry channel and the dam. Farther west on Unwin, construction of the transitional sports fields is underway. Unlike many people who frequent the area, I actually like the idea of having sports fields on Unwin. I think the Toronto Waterfront Revitalization Corporation missed an opportunity in constructing these as artificial-turf fields. 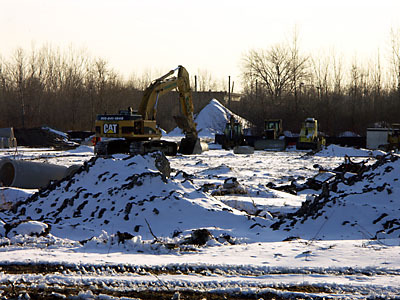 Natural grass fields would speak a lot more to the environment and sustainability, even if that would have required more site remediation than the TWRC was willing to do. This would be especially significant because these are intended to be temporary fields, lasting about 10 years before being relocated to some permanent location in the port lands. I’m betting that the “temporary” aspect gets lost somewhere between now and then. Otherwise, we’ll have an awful lot of poured concrete to dispose of in a decade. 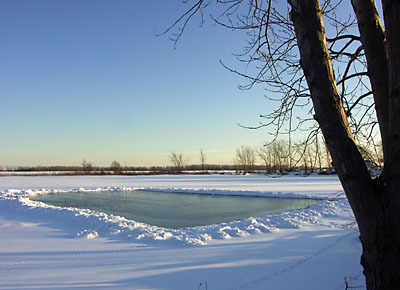 I also stopped in at my (shuttered for the season) sailing club for to see the winter scenery and noticed that someone at the club next door had cleared out a natural rink on the harbour. Unfortunately, it looked a little melty in the sun, so I didn’t risk a review. But it definitely would have scored a 10 for ambiance. I’ve always been fascinated by the little signs, slogans, or scrawlings that people use to protest some indignity, whether real or perceived. 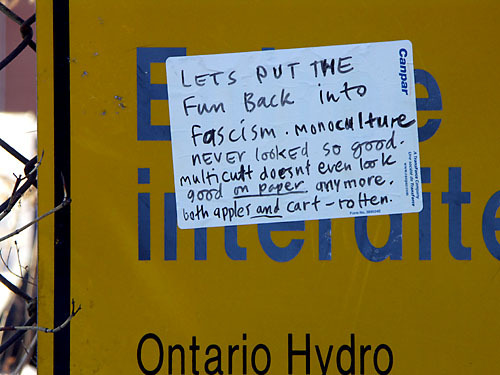 I found this one today stuck on a “no trespassing” sign at the Hearn generating station in the port lands. No, I don’t know what it means, or why the writer chose this particular location to make this particular political statement.